Kate got my message last night about an earlier start for the Tulum Ruins visit which was a good start to the day. Kate sneaked into the breakfast area to meet us having the presence to not take off the hotel bracelets when she checked out yesterday. I lead a small group down the the bus station for this independent travel activity. Joining me was Kate, Laura, Andrew, Yasmin and Jo. The bus company had put on a few extra buses today which is a bad sign that we could expect a lot of tourists. The weather remained overcast for the entire day but being Mexico it was never cold. We found the Ruins from the bus stop easily enough and we also found a lengthily ticket line as well. Later when we left this line had lengthened considerable so I consider our decision to come early a good one. 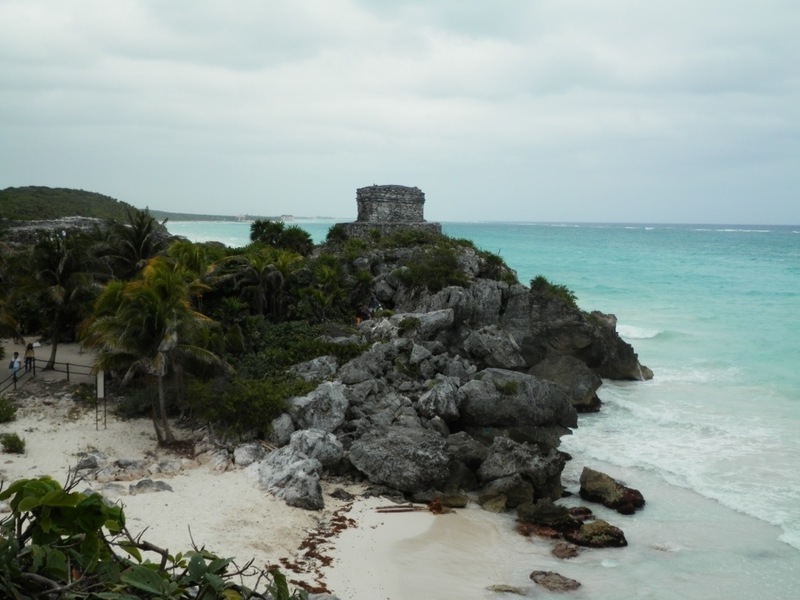 The Tulum Ruins are set right against the Caribbean Sea and in its day it was an extremely important trading port for the Mayan people. You could see how easy it would have been to defend as well. Just of the coast you could see the outlines of a major coral reef as well. The site isn’t huge but well worth a visit. For our return we caught a public van which they managed to fit 14 people into a little over capacity I think.